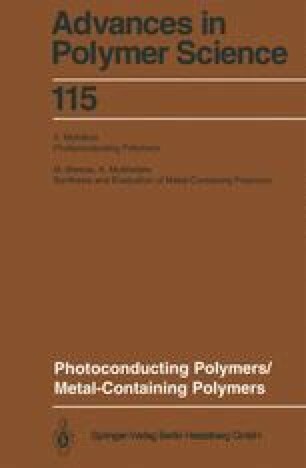 Photoelectric phenomena in all the available classes of organic polymers are reviewed. Photogeneration, transport and recombination processes of the charge carriers are analysed from the point of view of semiconductor physics. Special attention is given to the relationships between chemical structure and photoelectrical properties of the macromolecular compounds. Chemical and spectral sensitization of the photoconductivity by dyes and donor-acceptor molecules is discussed. The status and prospects of the application of the polymeric photoconductors as new prospective electronic materials are analyzed in optoelectronics, holography, nonlinear elements, electrophotographic and photothermoplastic recording.